We are a spirit filled, evangelical church that preaches from the Bible as God's inspired Word of life. We are an English language church community that have people from every part of India and even parts of the world. We are here to put the Great Command and the Great Commission into practice by equipping and releasing every member into works of service. This message was preached by Colin D Cruz at Word of Grace Church on the 4th of Jan 2015. To listen/download the audio please click here. When we come to the beginning to a new year we look forward to new things, new diaries, new resolutions etc. etc. So let’s seek God on what He wants us to focus on and do. My desire is that we would have some worthy goals for 2015. 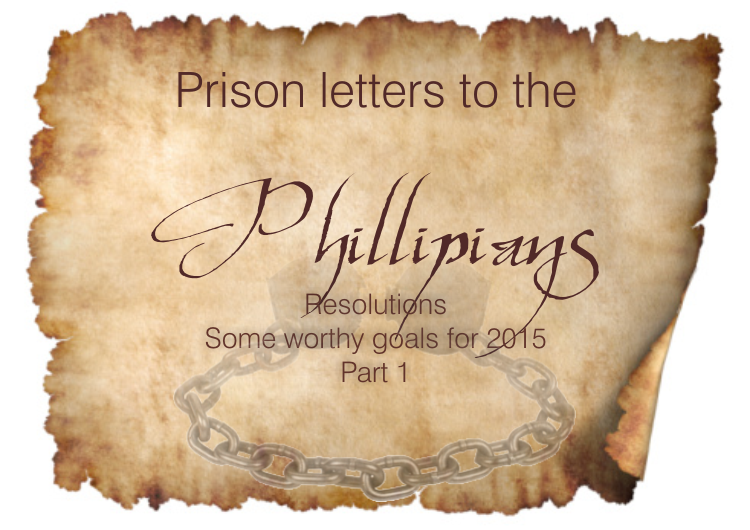 This letter was written to the Philippians by Paul. This church was planted by Paul when he was supernaturally led to Macedonia where he met Lydia (Acts 16) and she got saved. As they stayed there for some time, Paul had cast out a demon from a girl who used to foretell the future and her masters would make money from it. Now this caused a huge uproar in the city. Paul and Silas ( Acts16:22) were brutally beaten up and thrown into jail and put into stocks. What would your response be if this were you? The next thing we know in Acts 16:26 there is an earthquake, their chains fall off and in v.29 we read that the jailers gets saved, takes Paul and Silas to his house to wash their wounds. His family gets saved. V.33. Past midnight the jailer asks to be baptized. They are then escorted out of the city. The mighty Paul calls himself a servant, not Apostle, miracle worker etc. Like Jesus who did not come to be served but to serve we should have the same goal – to grow in humility and servant hood. Not to think more highly of ourselves. We should be able to serve even when not thanked and even serve people who are ungrateful. Q. Who is the letter addressed to? To all the saints. He is not just addressing the Elders, pastors or deacons but everyone. The Word of God is not just for leaders but for everyone. This includes children. Paul addresses them as well in the letter to the Ephesians. He addresses slaves as well. Paul is praying for them and thanking them for their partnership in the gospel. He was specific. This is something we could do- be partners in the gospel. How? They accompanied him on journeys and sent money to support him. Phil. 4:14-16. The Philippians supported him. Q. If Paul wrote this letter to you would he be thanking you for partnering with him? Are we actively proclaiming the good news? Paul says this demonstrates that we are true believers and he is confident that it will be completed. This is amazing!! He has begun something and he will finish it. “No power in hell, no scheme of man can ever pluck me from His hand”. This is a great assurance. However Ch2:12 “continue to work out your salvation with fear and trembling” So is this a contradiction? God works but God wants us to work as well. He will work in you by the Holy Spirit to help you to work it out. So it’s divine partnership. AS we read His word , the Holy Spirit will sit us up to applying the Word and the Holy Spirit enables us to do it. This is how the Christian life is lived. What would God have us do in the New Year? Often the things that occupy our minds are temporal. But look at what Paul prays for!! Paul prayed that they would grow in being a loving people. This is not an emotional flutter of the heart. It is a love that is a decision. It is agape love. Grow in being sensitive to people. This love may take many forms. We are thinking how can we bless, how can we serve. 1Cor13 we may have knowledge, prophecy etc but without love we are nothing! A worthy resolution is to grow in love this year. It’s the tone of voice, your smile etc etc. Paul was praying for discernment. We have many yo-yo /crazy ball Christians. Paul wants us to be able discern what is the best. There are many things that we can do but what is the best? Everything is permissible but not everything is beneficial. AS we study the Word of God it gives us a framework about what is best, where you live, whom you marry etc etc. Verse10 Pure and blameless – Integrity is very important. Our character is important. We are going to heaven because of what Jesus has done, because of the finished work of the cross. However we are called to live in a manner worthy of the gospel. Grace is not a license to sin. Throughout scripture Paul reminds us to live for Christ. Eph 5:1,3,4. Are there good works in your life? We know that we are not saved by good works but for good works. This is the end result. These are wonderful resolutions to consider not just for the New Year but till the Day of Christ!! Word Of Grace www.wordofgracechurch.org. Watermark theme. Powered by Blogger.